Silver dragons dwell among the clouds, making their lairs on secluded cold mountain peaks. Though many are comfortable in natural cavern complexes or abandoned mines, silver dragons covet the lost outposts of humanoid civilization. An abandoned mountaintop citadel or a remote tower raised by a long-dead wizard is the sort of lair that every silver dragon dreams of. The dragon creates fog as if it had cast the fog cloud spell. The fog lasts until initiative count 20 on the next round. A blisteringly cold wind blows through the lair near the dragon. 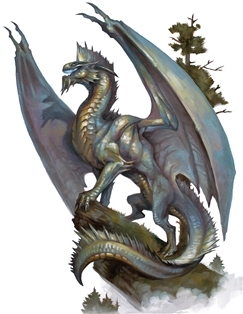 Each creature within 120 feet of the dragon must succeed on a DC 15 Constitution saving throw or take 5 (1d10) cold damage. Gases and vapors are dispersed by the wind, and unprotected flames are extinguished. Protected flames, such as lanterns, have a 50 percent chance of being extinguished. The region containing a legendary silver dragon’s lair is warped by the dragon’s magic, which creates one or more of the following effects. Once per day, the dragon can alter the weather in a 6-mile radius centered on its lair. The dragon doesn’t need to be outdoors; otherwise the effect is identical to the control weather spell. Within 1 mile of the lair, winds buoy non-evil creatures that fall due to no act of the dragon’s or its allies. Such creatures descend at a rate of 60 feet per round and take no falling damage. Given days or longer to work, the dragon can make clouds and fog within its lair as solid as stone, forming structures and other objects as it wishes. If the dragon dies, changed weather reverts to normal, as described in the spell, and the other effects fade in 1d10 days.